Seven years ago, Jua Howard was making something of a name for himself in neo-soul circles, crooning in velvety tenor tones reminiscent of Luther Vandross and Donny Hathaway in clubs from New York City to London. Anticipation, his 2007 self-released debut CD of mostly original ballads, was picking up play on smooth-jazz and R&B stations. During the summer of 2009, after quitting a nine-to-five job with a nonprofit scholarship program in Washington, D.C., Jua moved to the San Francisco Bay Area and enrolled at Berkeley’s Jazzschool Institute, which is now known as the California Jazz Conservatory. During his year there he became the first recipient of the school’s Mark Murphy Vocal Jazz Scholarship, named for veteran poll-winning singer Murphy. He also studied privately with vocal coach Raz Kennedy, formerly of Bobby McFerrin’s Voicestra. 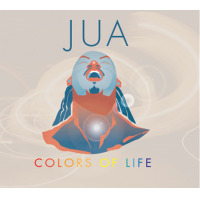 Currently residing in Raleigh, North Carolina, Jua now emerges as a unique and highly emotive jazz vocal stylist with the remarkable 10-song CD Colors of Life. Produced by Onaje Allan Gumbs, the veteran New York pianist, arranger, and producer noted for his work with Norman Connors, Nat Adderley, Woody Shaw, and many others, the album showcases Jua in the empathetic company of Gumbs on piano and (on one track) Fender Rhodes, guitarist Shan Kenner, bassist Gregory M. Jones, drummer Vince Ector, percussionist Gary Fritz, and tenor and soprano saxophonist Roger Byam. Colors of Life features four original compositions by Jua (three written in collaboration with his former Jazzschool instructor, pianist Matt Clark, the other with Kenner), along with the standard “Old Devil Moon” by Yip Harburg and Burton Lane and tunes by Sam Rivers, Abbey Lincoln, Bob Dorough, Bill Withers, and James Williams and Pamela Baskin- Watson. The disc opens with Rivers’s lovely “Beatrice,” which the saxophonist first recorded as a ballad on his classic 1964 debut album Fuchsia Swing Song on Blue Note. Jua became captivated with the song when Jazzschool instructor Mark Levine presented it during a jazz theory class. Jua proceeded to set his own lyrics to it for a vocal class. He and the band swing it at a brighter tempo than Rivers had. On the plaintive “Time Past,” which talks about an individual’s personal, fluctuating relationship with time and how fleeting it is, Jua’s use of richly resonant sustains helps to emotionally enhance the song’s meaning. He wrote the melody for the bridge and all the lyrics, around which Clark put finishing touches. Jua first came across Dorough’s “Love Came on Stealthy Fingers” in a songbook and was initially intrigued by the adjective “stealthy” in the title. After learning the song, he checked versions by Irene Kral and Carmen McRae, and then worked up his own take on it with help from Kenner, who provides the sole accompaniment with his acoustic guitar. .
Kenner composed the jazz waltz “Colors of Life” as an instrumental, upon which Jua created a multi-hued palette of life-affirming metaphors with his lyrics. “You’re My Alter Ego” was written by the late jazz pianist James Williams with lyrics by Pamela Baskin-Watson. Jua first heard the song performed by Jazzschool vocal director Laurie Antonioli at a benefit concert for Mark Murphy Vocal Jazz Scholarship. Jua says that Withers’s “Let Me Be the One” is one of his mother’s favorite songs. “Onaje did a great arrangement of the tune that even if you’re familiar with the original, you really don’t think of it the way it’s arranged on this album,” Jua adds. Colors of Life ends on especially positive notes with two collaborations by Jua and Clark: the lilting “Believe” and the swinging “Finally.” “I’m a believer in staying positive and having the right perspective about whatever you’re going though in life,” the singer says. Both tracks feature robust tenor saxophone solos by longtime Gumbs associate Byam. After ten years in the Windy City, Jua and his mom moved to Lanett, Alabama, where he began playing trumpet in the fifth grade. He joined the youth choir at a local Baptist church and was frequently called upon to solo. While in high school, he was selected for the Alabama All-State Boys Choir, an ensemble of some 70 voices that focused on European classical music. He and his mother then spent two years as members of the All-Atlanta Choir and made frequent four-hour round trips to the Georgia metropolis to rehearse and perform. Jua then enrolled at Emory University in Atlanta, where he sang in the gospel choir and graduated with a B.A. in English. Disillusioned with performing in vocal ensembles, Jua stopped singing for two years after graduation. He returned to Chicago, where he briefly worked at a law firm before becoming a fifth-grade substitute teacher. Encouragement from vocal coach Sondra Davis caused him to resume applying his richly rounded multi-octave pipes to song. Jua cites Vandross, Hathaway, Al Jarreau, Johnny Mathis, Mark Murphy, and gospel great Daryl Coley as being influences on his style. Yet, as evidenced throughout Colors of Life, Jua has developed a distinctive, emotion-gripping approach to song that’s quite wonderfully his own. All About Jazz musician pages are maintained by musicians, publicists and trusted members like you. Interested? Tell us why you would like to improve the Jua musician page.